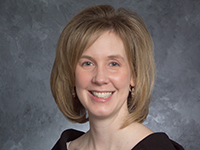 As the newly appointed Assistant Dean for Assessment at Duquesne University School of Pharmacy, Dr. Monica Skomo is looking forward to using assessment data to improve the educational experience for all of the school's student pharmacists. "The overarching goal is to utilize assessment data to be able to improve the school, the curriculum, and students' learning. We don't just do assessment for the sake of doing assessment. With each iteration of the Accreditation Council for Pharmacy Education (ACPE) standards, there is more and more assessment that needs to be done," Skomo said. "There are so many misconceptions of assessment just being about students taking tests, or that we're only concerned about it because of accreditation, but goes so far beyond that. I want to make sure we do assessment in a meaningful way and utilize it to really affect change so that it helps the program and helps the students." Skomo said that there are many different sources that are utilized by the school for programmatic assessment, with two of the biggest sources being American Association of Colleges of Pharmacy (AACP) surveys that are given every year to graduating students, faculty, alumni and preceptors; and data complied from the computerized testing system ExamSoft. "ExamSoft gives us the ability on an individual question level to map a question to as many areas or competencies as we want. It gives us the ability to look at how an individual student performed on an individual exam, to see where strengths and weaknesses are - across a semester, across a year, across the first, second and third years of the professional program - and really be able to see how they're performing in particular competencies," Skomo said, "It goes beyond grades. Identifying students' strengths and weaknesses really utilizes assessment data to be able to help improve student outcomes." Skomo earned both her Bachelor's degree in pharmacy and her Pharm.D. from Duquesne University School of Pharmacy. Prior to her appointment as Assistant Dean for Assessment, She completed a fellowship at Duquesne during the 2004-2005 academic year, and became a faculty member in 2005. She served as Co-Director for Assessment in 2013-2014 and became director in July 2014.